The landscape of ministry is rapidly evolving as more and more lay persons take on significant ministry roles. Part of this trend is a growth in lay church staff. In some denominations today, there are more lay persons receiving church paychecks than there are clergy. Yet our mindset about ministry hasn’t been as quick to change. Lay ministry practitioners are often ill-prepared and underappreciated, confused about their call, and unsure of their theological identity. Synergy is a leadership guide that speaks directly to their needs. Ann Michel presents a more inclusive, collaborative understanding of ministry, which affirms the gifts and calling of both clergy and lay servants. She uses the concept of “synergy” as a theological framework undergirding this approach. Michel lays out an inclusive and collaborative paradigm of ministry affirming the work of both lay and clergy servants. 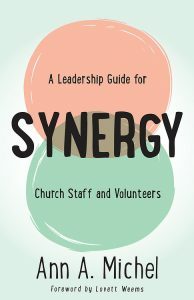 Synergy also provides practical advice on the day-to-day skills of synergistic or collaborative ministry — how to engage others in ministry, how to build teams, how to manage meetings, how to develop others as leaders, etc. The book helps church workers, paid and unpaid, understand how their ministry relates to the mission of God and the ministry of the church, and provides practical guidance on the interpersonal ministry skills essential to any expression of collaborative ministry.